Our April/May Selection: Shark's Fin and Sichuan Pepper, a Memoir by Fuchsia Dunlop. 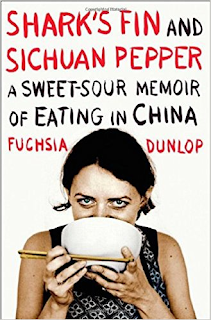 Almost every time I *talk* about great foodie books with online friends at my favorite book sites, Shark’s Fin and Sichuan Pepper: A Sweet-Sour Memoir of Eating in China by Fuchsia Dunlop comes up as a "must read." I have had it on my (ginormous) TBR list for ages, I snapped up a Kindle Deal for it several months ago, and in order to get myself to finally read it, I made it our April/May selection. 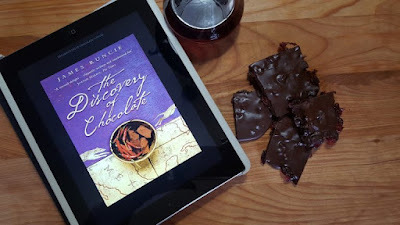 It's time for the roundup of Cook the Books' Club February-March 2018 edition for which we read the novel The Discovery of Chocolate by James Runcie. Make yourself comfortable, then follow me on a literary / culinary journey in the company of chocolate. How can you turn down such a sweet invitation? "I would actually give this 2.5 stars out of 5. It was a little more than okay, but I can't say I'm wholly in the 'like it' camp either... It started off well, then descended into silliness as, over the course of his chocolate elixir-extended lifespan, Diego encounters the Marquis de Sade, meets the inventors of the Sacher Torte, works for Hershey's, and comes full circle with Ignacia. It's a fanciful narrative about one man's history with chocolate wrapped around a contrived love story with some bizarre twists of fate. I didn't hate it, but I wouldn't read it again... I did love Diego's description of introducing mole to dinner guests back in Spain." Camilla also shares "a little about my chocolate obsession. It's funny for me to think that sixteen years ago, I didn't eat chocolate." "This book would have been much better off as a novella featuring the love story between Diego and Ignacia. The first quarter and the last tenth of the book were the only parts that were worth reading. The part in-between were mind-numbingly boring and nonsensical... I mean seriously, how can you make chocolate boring? So frustrating! Hot chocolate played a huge (and confusing) role in this story, so this recipe fits the bill perfectly. Except, let me tell you something. This recipe totally uses hot chocolate mix, because I would have a full scale revolt on my hands if I tried anything else!... 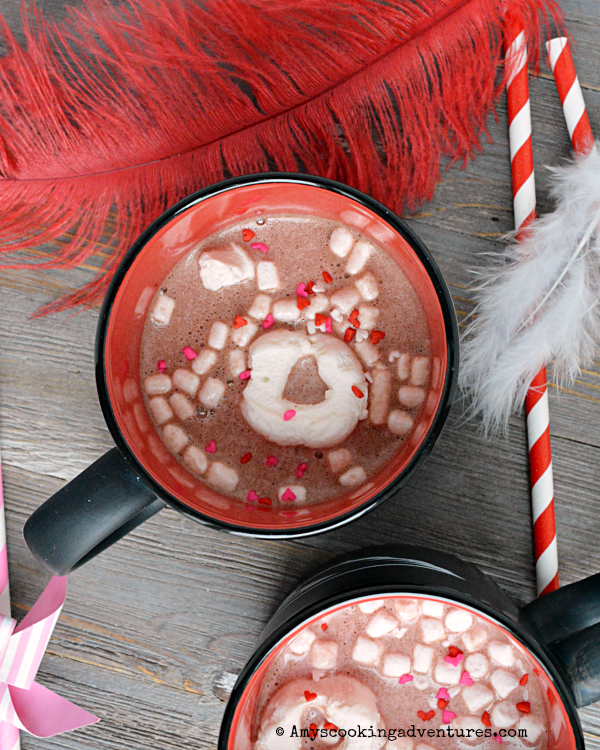 You could definitely make this with a homemade hot chocolate or a dark chocolate mocha!" Though "Heart Cocoa for Two is the perfect Valentine's treat for you and your sweetie!" nothing will stop you if you prepare it at other times during the year. 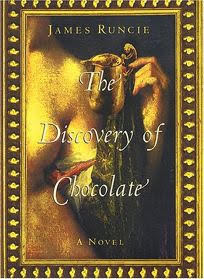 "It is a fantastical journey through the history of chocolate by one, Diego de Godoy, who first discovers chocolate in the 1500's when given it as a drink by his one true love, Ignacia. Unknown to Diego, the chocolate was spiked with magic that gave him eternal life. This life was spent learning all he could of chocolate in memory of his lost love... It is a fun read and gives you a pretty concise lesson on the history of chocolate. And oh my, the food... and not only chocolate: food dishes of all sorts were described in tantalizing prose until you caught yourself drooling all over your book. I just had to make a Sachertorte... Diego created this historical recipe when trying to cover up another's mistaken spill of apricot jam onto a chocolate cake. No? Well, that's what the book said... This decadent and delicious cake... made the perfect Birthday Cake for our daughter." "Runcie’s premise is clever and I started out loving the book. The author began losing me a bit after the 'invention of Sachertorte'. Then there was the tragic and ludicrous invention of the Hershey Kiss. Really? (Diego also invented Pain au chocolat)... Food abounds in the novel, and not just the sweets that one associates with chocolate. There’s the bounty of Mexican markets, fruit from Viennese orchards, and many savory dishes... I decided to experiment and make some bourbon infused cranberries and douse them in chocolate. I couldn’t help but be inspired by the Marquis de Sade’s raspberry liqueur creams as well as all the different liqueur combinations that Diego creates... I used the leftover bourbon for a cocktail." Chocolate "can be an ingredient that enlivens sauces and savory dishes... Today it has become the soul of the Mexican kitchen in the form of mole sauces. 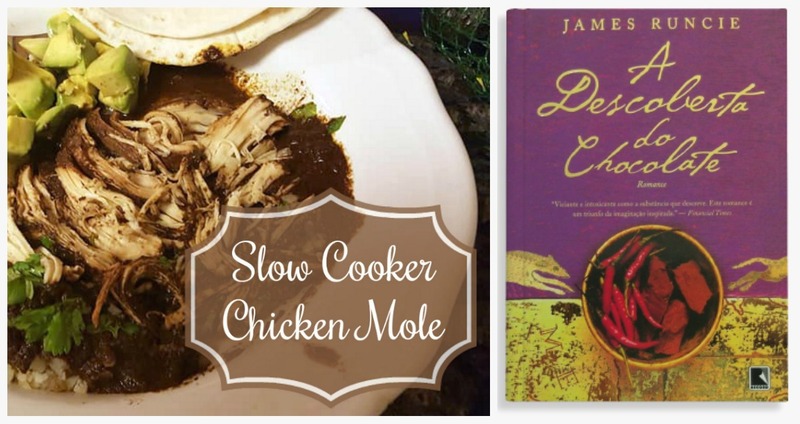 In mole, chocolate is a transforming ingredient, lending a hint of sweetness, a silky fullness, spice and complexity to its dinner partner, which can be chicken, turkey or other meats... Diego discovers mole during his first experience in Mexico. As a gift of love, Ignacia embarks on a daylong process of preparing a feast for him. Her mole poblano began with re-hydrated dried dark chiles, vanilla, star anise and chocolate. Diego says that 'she made me inhale each spice before its inclusion in the mole'... Chefs today claim that choosing the right chocolate is the key to success in making mole." "I did decide to return and finish the book a few weeks later, albeit with reservations... Suffice it to say that Runcie's debut tale does end well, though I much prefer his later writing. The book was packed with food mentions, so plenty of inspiration for us at Cook the Books! Everything from chocolate in all its many guises, to European goodies encountered and created on Diego's journeys... My response, aside from a Chocolate Rum Soda concocted from home-crafted Creme de Cacao, was to make something inspired by the New World of Mexico. 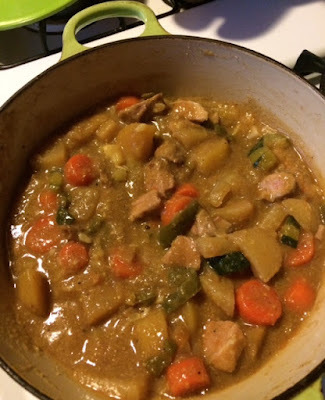 A stew, with lots of veggies, spices and pork loin, all thickened a bit with cornmeal." "I love magical realism, and found the premise very interesting, while being a good bit less enamoured of Diego, who... is, himself, a profoundly uninteresting man... It helped a lot to know that James Runcie originally intended to write this as a series of short stories, and I am sorry he chose not to handle it that way, as a more episodic approach would have solved the weaknesses it had as a novel. In a short story series, you have lower expectations for actual character development and growth, and can focus more on shorter term events... I settled on a savory dish rather than sweet, as I wanted to do something more rooted in chocolate's origins than in Europe's use of it. I've wanted to make Chicken Mole for a long time... The result was very flavorful... and quite fast to put together with the help of a food processor and slow cooker." 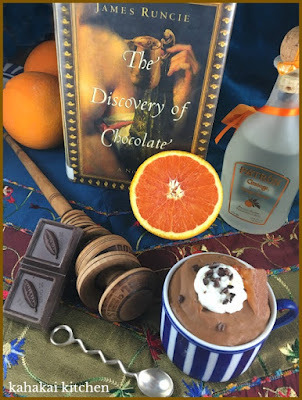 "Drinking a special concoction [Ignacia] prepares for [Diego] makes him immortal, which allows the novel to span centuries and continents, following Diego's adventures and the fortunes of cacao beans and chocolate... Having decided to make mole poblano, the question became: which recipe?... I chose a middle ground closer to the hard way... which meant a somewhat lengthy preparation using 25 ingredients. my choice of ingredients makes the recipe vegan and gluten-free... My rendition of mole poblano paired well with different dishes, vegetables (the dish in the photo is my 'empty the crisper' side dish described in an earlier post, chicken and even cod. I confess also that I ate it by the spoonful." "It took me a while to get into the book. I wasn't particularly fond of Diego from the start as he is young, selfish, and not that appealing. In fact, my favorite character turned out to be Pedro, his loyal greyhound... I do like time travel and I adore chocolate and learning about food history, so eventually the story kicked in more for me... While on his travels, Diego has brushes with many diverse historical figures such as Montezuma, the Marquis de Sade, Sigmund Freud, Gertrude Stein and Alice B. Toklas, and Milton Hershey... Besides Pedro, ;-) the food descriptions were my favorite part and the book is filled with them... I took my inspiration from the 'excellent chocolate mousse' that Diego is offered after dinner on a ship with Alice B. Toklas and Gertrude Stein." And now, I’ll turn things over to Deb of Kahakai Kitchen who is hosting the April-May edition in which we are reading Shark's Fin and Sichuan Pepper, a memoir by Fuchsia Dunlop.